Eight students will take part in the 2019 Humanities Undergraduate Research Fellowship Program, where they will work closely with a faculty member on a 16-week research project to be presented at the Undergraduate Research Symposium in May. The cohort will meet regularly during winter and spring terms to work on their projects and participate in seminars about developing research skills, communicating research, understanding the ethics of research and preparing for graduate school or other career opportunities. 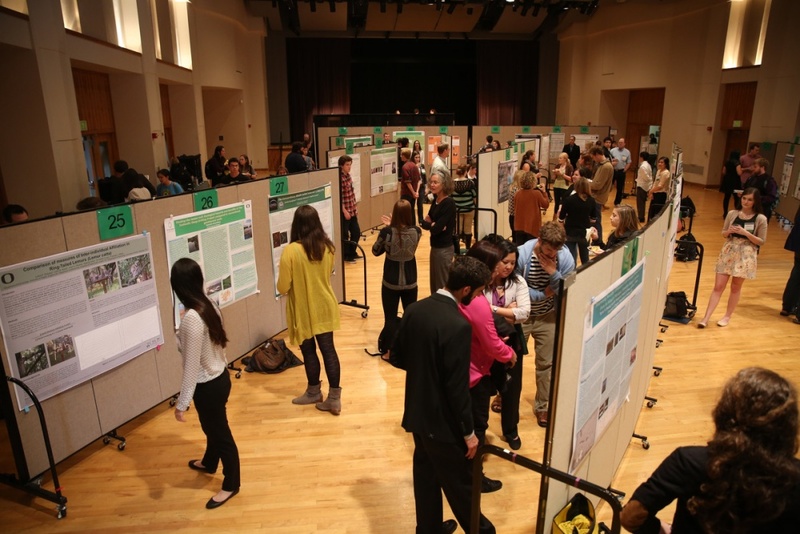 The Oregon Humanities Center, Office of the Vice President for Research and Innovation, Undergraduate Research Opportunity Program and Division of Undergraduate Studies collaborated to create the program. Cydnie Davenport, linguistics and Russian, East European and Eurasian studies: “Dialect Variation in English: An Investigation into the Disappearing Word Effect.” Faculty mentor: Melissa Baese-Berk. Violet Fox, anthropology: “‘I Can Make People In My Tears:’ An Urban Anthropological Study of Homeless Women in Eugene, Oregon.” Faculty mentor: Lamia Karim. Alice Harding, history: “Migration in the Bronze Age Near East.” Faculty mentor: Lindsey Mazurek. Anika Nykanen, English and humanities: “Literary Racialization: The Function of Children in Southern Gothic Literature.” Faculty mentor: Mark Whalan. Kendra Siebert, journalism/advertising; “An Exploration of Urban Art as Cultural Testimony Throughout Social Movements in Mexico City and Oaxaca.” Faculty mentor: Peter Laufer. Ally Shaw, Asian studies and linguistics: “The Role of Intonation in Japanese Politeness.” Faculty mentor: Kaori Idemaru. DeForest Wihtol, English and Spanish: “Caliban Yisrael: The Jewish ‘Other’ in Shakespeare’s ‘The Tempest’ and ‘The Merchant of Venice.’” Faculty mentor: Kate Myers. Scott Zeigler, English: “Antagonistic River: The Agency of Nature in Northwest Fiction.” Faculty mentor: Gordon Sayre.